This article applies to the transfer of popups or popup themes between sites using the WordPress content export/import feature. Popup and popup theme transfers cannot be done together in a single action. Each transfer must be performed separately. The Popup Maker plugin must be installed and activated on both sites in order to transfer popups or popup themes. Popup Maker includes 6 pre-built popup themes that are installed on plugin activation. Those themes remain stored in the database even when the plugin is deactivated. Popup themes imported from a source site will include those same 6 themes within the export file. This assumes that none of the themes to be exported were deleted from the database beforehand. Plugin theme names on the target site will appear twice after popup themes are imported. On the Popup Theme admin page ( Popup Maker >> Popup Themes ), the original popup theme names appear along with the theme names added by the import file. In the Popup Settings box of the Popup Editor ( Popup Settings >> Display >> Appearance >> Popup Themes ), the imported popup theme names are added to the Popup Theme option menu. Important! Avoid theme name collisions on the target site by renaming any customized popup themes on the source site before they are exported. Use the 'Quick Edit' menu located beneath the popup theme title to rename the title and slug name. If you are reading this article after importing popup themes, and the customized themes were not renamed beforehand, read the section below 'How to Resolve Duplicate Popup Theme Names and Option Settings' to resolve theme name collisions. Open the WordPress Admin of the site that contains the popups you intend to export. The download contains only the data for the popups on your site. Popup Themes must be exported separately. 4) To export the 'Popup Themes', select the radio button for that option and select the 'Download Export File' button a second time. 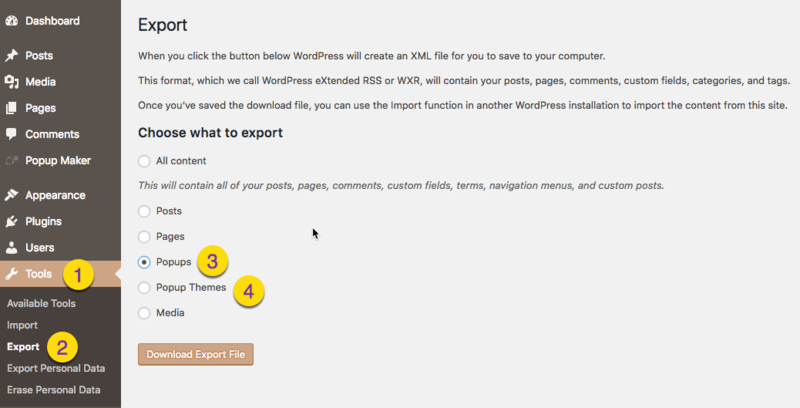 Open the WordPress Admin of the new site where the export data will be uploaded. 3) Select the 'Install Now' link under the WordPress option. 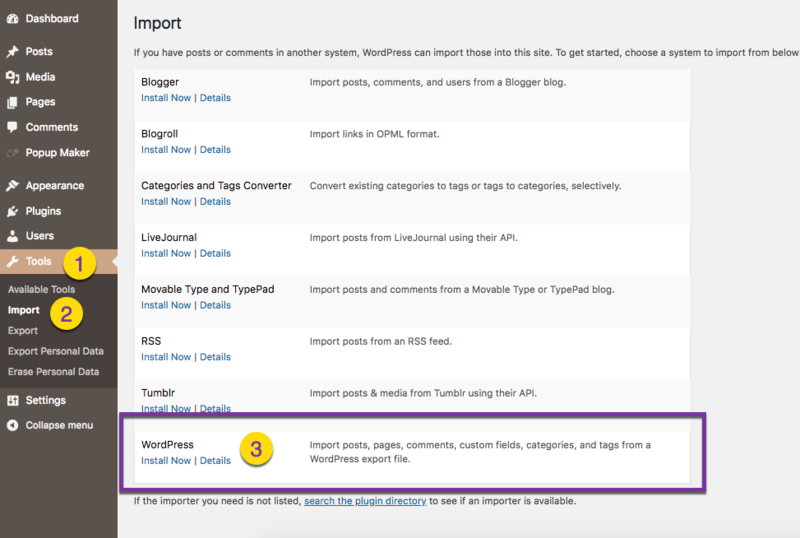 WordPress will redirect to an 'Import WordPress' option page. Select the button labeled 'Choose File'. Upload the exported Popup Maker XML files from your computer one at a time. If both the popups and popup theme files were exported, each file must be imported separately. 1) Open the Popup Theme admin page on the target site (the site that received the import file). From the WordPress admin, go to: 'Popup Maker' >> 'Popup Themes'. 2) Focus on the first popup theme name, and select the 'Edit' link. includes the query string ?post=18. This means the popup theme has an ID of 18 in the database. Note this value. 4) On the same page, open an imported popup theme with a duplicate name that matches the previous theme title. Note the post ID of this theme. The post ID of the imported theme should be greater than the originally installed theme because the imported theme was added later. 5) To distinguish between the original and duplicate popup theme, rename the title and slug name of the imported theme. Select 'Update' to save your changes. 6) Repeat steps 3, 4, and 5 with any additional duplicate named themes you are interested in using. Display (tab) >> Appearance (category) >> Popup Themes (menu). The renamed popup themes will now appear in the drop-down menu.